A Book and a Record: Hex Hall: Happy Halloween! Summary: courtesy of goodreads.com Three years ago, Sophie Mercer discovered that she was a witch. It's gotten her into a few scrapes. Her non-gifted mother has been as supportive as possible, consulting Sophie's estranged father--an elusive European warlock--only when necessary. 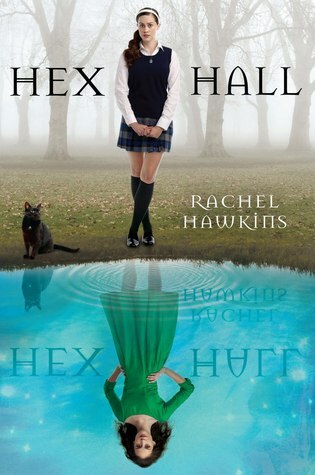 But when Sophie attracts too much human attention for a prom-night spell gone horribly wrong, it's her dad who decides her punishment: exile to Hex Hall, an isolated reform school for wayward Prodigium, a.k.a. witches, faeries, and shapeshifters. My Review: I went into Hex Hall after finishing the emotionally draining Finnikin of the Rock and Froi of the Exiles. I had a sort-of call for help for something fluffy and my call was definitely answered! Hex Hall was such a fun read, and I couldn’t help but adore Sophie. Her heart it totally in the right place and she tries so hard to befriend people, even though she is on the complete outside. At times I felt a little bit like I was reading a Harry Potter spin off (and I mean that in a good way) with the way Hawkins described things. The world building was similar to Harry Potter because it was this magical place that held a lost of base in reality. Setting it in the South could not have been a better place. I don’t know about anyone else, but I love books that are set in the South, there is so much history there, so much magic. I have to say, the only thing that I wasn’t really sold on was the relationship development between Sophie and Archer. Now, you all know me, I love a little love story. Sometimes I even love the insta-attraction, but with Hex Hall it felt like Sophie was forcing herself to like Archer. I know what you’re thinking, “but she keeps telling herself how much she doesn’t like him.” And I get that, but I felt like this was a little reverse psychology on the reader, like “I know he is bad for her, but they should still be together anyways.” It just rubbed me slightly the wrong way. Don’t misunderstand. I still was excited with the scenes between Sophie and Archer, but I felt like she deserved someone better than him, someone like the groundskeeper guy. He was sweet and funny and very alluring. Usually I don’t root for someone on the sidelines of a story (with the exception of Maureen Johnson’s The Name of The Star), but I am definitely rooting for Sophie and Cal. I like Cal. Cal is a reserved little hottie. I know, this will probably break my heart later (because it always seems like in book love triangles the girl ends up with the first person they fall for, even though, in the wise words of Johnny Depp: “If you love two people at the same time, choose the second. Because if you really loved the first one, you wouldn't have fallen for the second.”) I’m not saying Sophie WILL fall for Cal (hello, I have not read that far yet yo!) but if it did happen I would definitely be rooting for them to end up together. I mean, Archer was with Elodie, how smart can he be? The other thing I adored about this book were the characters. Even the villains were fun! They were so well rounded and thought out. From Jenna to Elodie I liked them all. They were distinctive and awesome. I will definitely be continuing this series, probably not immediately, but definitely in the coming weeks. Such a fun world to escape to for a while. And BONUS: It's PERFECT for Halloween! Happy Haunting y'all!